Founded in 2010, Sweet Woodruff is a boutique Floral & Event Design company based out of Southern Ontario. Sweet Woodruff believes in purposeful design. Our approach is thoughtful and artistic. We love the juxtaposition of new with old, masculine and feminine, darkness and light. We strive for elegance without being stuffy, natural without being shabby. We believe luxury should look effortless. We think flowers should look like how they’re found in nature. Though I'm still mostly speechless after seeing everything come together last night (there have been a lot of happy tears), I wanted to tell you again just how much Kevin and I appreciated all your hard work, your attention to detail, the beautiful surprises you included in the set up last night, and the INSANE transformation you and your team did to the venue space. I knew you guys would make it look amazing in there, but this was just beyond anything I ever could have imagined. My bouquet, the terrace, the chuppah, the ceremony space, the tables, the hanging greenery, the huge stunning bar arrangement!! Honestly, we loved every single bit of it. I think every guest commented on how beautiful the flowers were and how cool it was to see the space set up like this. You were a total pleasure to work with, and I may be SO over wedding planning, but I truly will miss you and Lu and this sweet little team we made. I can't thank you enough for making this special day absolutely beautiful too. And please extend all my thanks to your whole team as well! Hope you're getting some downtime today after all your hard work! I just wanted to let you know that you and your staff did an INCREDIBLE job on the floral arrangements yesterday. 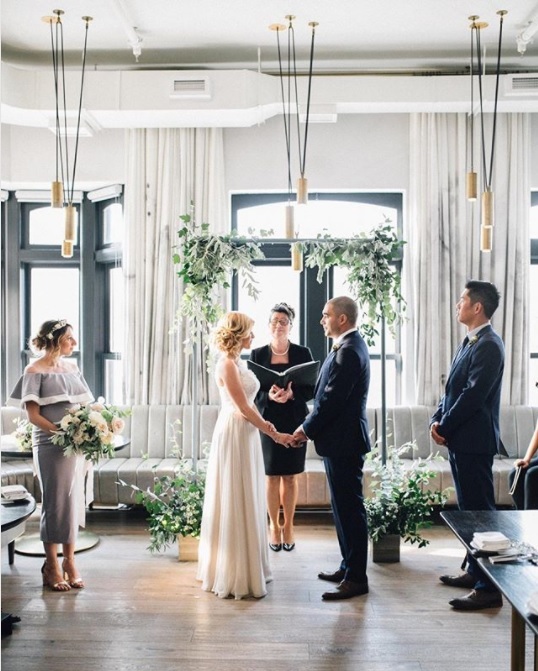 Everything looked amazing and I could not have asked for a more prefect look for the space— it was beyond what I was envisioning. The arrangements made the restaurant come alive and I’m so thankful for your work. Also, the way you presented the bouquets and boutonnieres was amazing and made everything that much more special. I just wanted to take a quick sec before we take off for our honeymoon to say thank you SO much for all of your hard work on our wedding. The day could not have been any better; the florals were absolutely perfect. We are so blessed to have found you and so grateful for your artistry and the time you took to talk out my vision. Everything came together better than I could have ever imagined. I'd like to say there was one part that was my favourite, but everything was so brilliantly put together - from the bouquets which complemented the bridesmaids dresses so perfectly, my bouquet (SO soft and feminine and worked with my dress SO well), to the arrangements at the church (I literally spent the entire ceremony front row centre and could not take my eyes off of what you created), to the arrangements and single buds around the Shang... I was just dying. It was all perfect. Thank you also for the reassurance around linen choice. It worked out so so well and it looked like the room was literally meant for those florals and tablescapes. Also, those candle holders were to die for. I received so many complements already!!!!! Anyway, I'll stop gushing but could go on for hours!